FREE ART, FREE 3D, FREE EPOXY, FREE FINISHES and FREE SHIPPING WITH OUR PREMIER LEVEL CUSTOM CHALLENGE COINS! "Gray Water" is a veteran owned company in Central Pennsylvania. We design three main products: Challenge Coins, Lapel Pins and Patches. Custom Challenge Coins These are custom minted coins with your design and message on each side. We can also mint custom challenge coins, medallions, military coins, Coins of gratitude, promotional coins, event coins, fraternity coins, college coins, commanders coins or any type of small metal coin between .25 inches and 4.5 inches. The minimum order for custom minted coins is 100 for the initial order and reorders. A die is required to make your custom design. This die will be maintained and kept on file for future reorders. When you place a reorder, all you need is your customer ID (GWXXX). You don’t pay a new die fee unless you want to change something on the current design. Our challenge coins are known worldwide for the quality, design, weight and thickness. Our coins are unique and stand out from the crowd. That’s why organizations like NASCAR, WORLD of TANKS, WORLD OF WARSHIPS, and US Military units deployed all over the world trust the guys at Gray Water for their unique designs and high quality products to include a patented coin that has an embedded NFC chip in the middle of the coin! Imagine touching your phone to a coin with a NFC chip in it and a web page launches on your phone… or you tap your phone to the coin and the contact information from the coin is stored in your contacts. Or you can even use it for a magic trick! The possibilities for marketing are endless! Custom Lapel Pins Lapel pins are great for any organization, club, event, festival, school, fundraiser, token of appreciation or retail item! Our custom lapel pins are made to your design specification and you never pay an art fee! Lapel pins make great affordable giveaways for special events or to commemorate an event. Common lapel pin sizes range from .25 inches to 1.25 inches. We can also mint custom tie tacks, cuff links, hat pins or similar items. You can choose a clutch type back or a locking back with a pin or screw on post. Custom Embroidered Patches and PVC Patches We have been creating fighter pilot flight suit shoulder patches, unit emblem patches, embroidered nametags and PVC patches for the past 9 years. Our quality is obvious in the product and our customers keep coming back and referring us to other units. You can choose between no backing, heat seal back or velcro at no additional cost. You can have a hot knife cut edge or a merrow edge at no additional cost and there are no digitizing fees or stitch count fees. 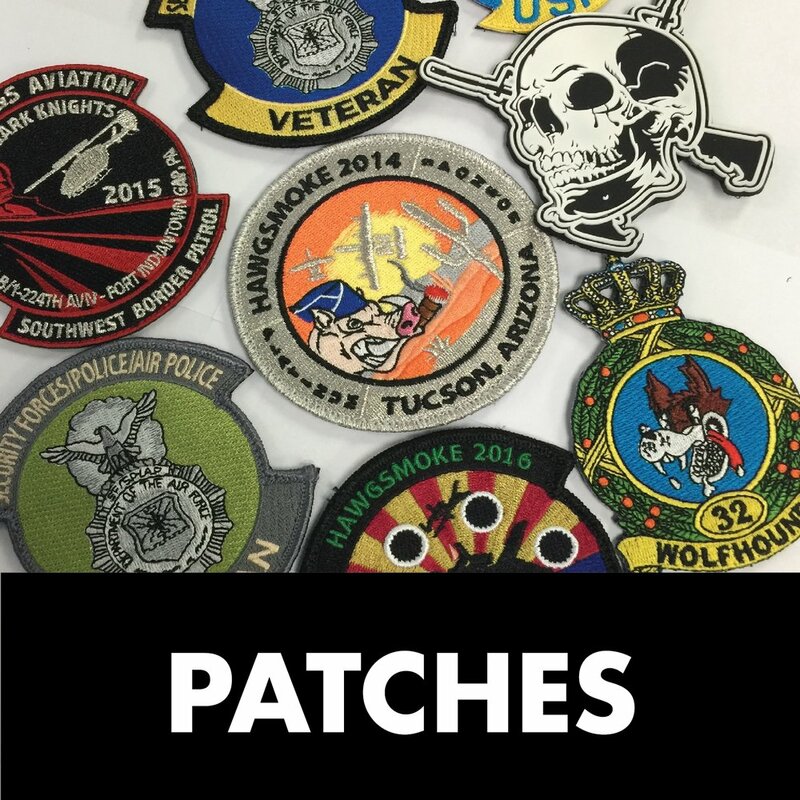 Most of our custom 3” - 4” embroidered patches are $3.80 each for 100 embroidered patches. The PVC patches require a one time mold that is used to produce your PVC patches. FACELIFT PROGRAM - Upgrade your old coin and SAVE! Ask us about our facelift program and see if your old unit coin qualifies! We can take your existing coin, give it a facelift by improving the design, weight, quality and thickness and WAIVE your die fee! Have a small 1.5" coin from 10 years ago? Let us upgrade it to a 1.75" or 2" coin and just pay the low per coin price! FREE SHIPPING on our premier level coins! Find out why people all over the world know the name Gray Water Ops! Gray Water Ops was started in 2009 with one simple mission, to offer the men and women serving in our Armed Forces with the highest quality, custom challenge coins and patches they deserved. Our goal is to put as much dedication and heart into our work as they do in theirs. Today we have transferred that same expertise and dedication into creating some of the best coins and embroidered patches on the market. We are known worldwide for the quality of our challenge coins and lapel pins, as well as our 24 hour customer service and support!